Flamenco dance is a healthy addiction I took up years ago. On my 18th birthday, a friend of mine treated me to a flamenco recital where I was astounded at the passion & fire I saw unfold before me on stage. For anyone who has witnessed live flamenco before, you know exactly what I mean! Shortly after Tim left on his mission, I began flamenco classes as a healthy outlet for emotions and haven’t looked back since. A few months ago I began collaborating with a local flamenco guitarist named Gabriel Edgar who truly is among the most talented guitarists in the state. He plays with an flamenco fusion ensemble called Hidden Truth & we have been collaborating on some exciting pieces. On Friday, October 24th, we will be opening up for a jazz pianist/singer in Salt Lake City at a non-smoking bar called the 5 Monkeys (7 East 4800 South just off State Street). Our set starts at 9pm and we’d love for you to come support the local arts community! 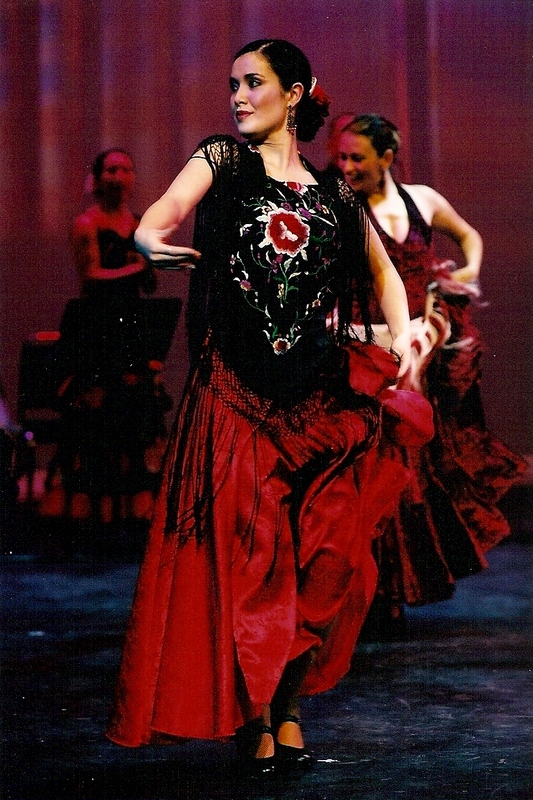 At right: a flamenco performance in Vancouver, Canada for Mozaico Flamenco Dance Academy. Photo credit: Doris Freidich. Today I decided to do something I haven’t done in a long time – flamenco. It was invigorating to think I wasn’t doing this for Tim, Blue Bijou or Pre-Paid Legal, it was just for me. You gotta know when I’m standing at work with co-workers and have the urge to break out into Sevillanas mid-conversation, it’s time to dance again. The Academy of Dance Design in Saratoga Springs (website to come) has an airy, spacious studio that I rent to practice old choreographies. During the summer of 2006, Kasandra of Mozaico Flamenco taught a Solea por Bulerias choreography which I really took to and even performed that October alongside Pirouz of www.flamenco.ca and Marek of La Triana. Thanks to a recording from dear Farnaz, my Solea is being polished once more. This Saturday night, Bien Flamenco is performing at the Arte Latino festival in Park City, Utah at the Kimball Arts Center, 6pm. For more details, visit www.kimball-art.org. 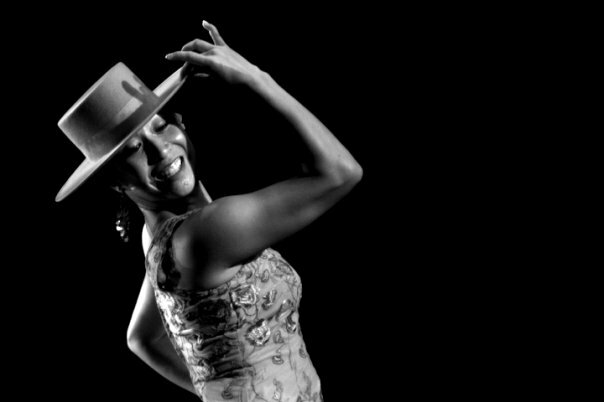 I look forward to being inspired by live flamenco and meeting Sariah, the genius behind Bien Flamenco. There is a growing caravan of us attending, so feel free to invite yourself and join us for this Saturday night getaway in Park City! I was watching flamenco videos on YouTube this morning (many of which were somewhat painful to behold) and happened upon one of my favorites, Eva Yerbabuena. She came to Vancouver in February of 2004 and I had the pleasure of seeing her perform at the Orpheum theatre. It was astounding and inspiring. 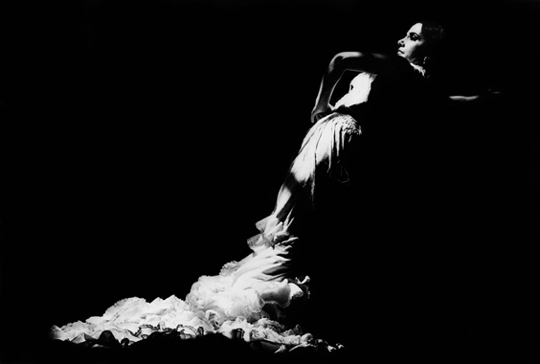 I happened upon this photo again today — one of my favorites in all flamenco. After watching some pretty bad choreographies on YouTube, it made me appreciate even more Kasandra “La China” and Mozaico Flamenco in Vancouver. You just don’t get that kind of quality everywhere you go and I’m grateful for the time I have been able to spend under their tutelage. Hopefully it won’t be long before I will study with them again. In the meantime, I have contacted a performing flamenco group in Utah called Bien Flamenco and will be attending a show of theirs in March. Sariah, the leader of the group, is apparently “the closest thing to the mother land [Spain] in Utah” so I look forward to pursuing private lessons with her. Furthermore, what Utah is in serious need of is a pena like Kino Cafe where people can go to see raw, live flamenco in an intimate setting and enjoy drinks, tapas, good company and be inspired.